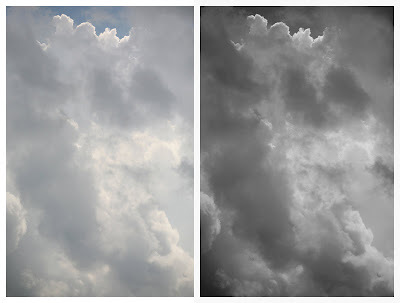 On the left is a photo of clouds on a typical sunny summer Minnesota day. Happy Clouds. These clouds aren't particularly happy. For that you need deep blue sky, and maybe some sunbeams streaming out from behind. But these are normal middle class American clouds. The clouds on the right are a bit angrier. I'm a big fan of these clouds that don't have anything more to show for their cloudness than a a few streaks of silver lining, but I believe most people are biased towards the super-dramatic Jesus Clouds, or the evil, dark and stormy clouds. What I keep asking myself is whether or not photographs of average Joe clouds are appealing to anyone but myself. I watch clouds all day. Drivin around, walkin around, havin some lunch.... All the time I am watching clouds and most of the time what I see are average clouds. I feel a good deal of peace looking up at these undramatic clouds, and I also feel like this looking at their photographs. Another reason why I like these average clouds is that as a photographer it keeps me away from the clouds cliches you get when taking pictures of clouds with dramatic beams of light poking through, or of the black clouds about to break. With the normal clouds I can focus on patterns and composition, such as it is with clouds. Oh well. I'll see where this is heading in a month or two.